Have a CPA look over your financials and give professional advice for free. No obligation to you. Make sure your accounting is in order and accurate. Are you overpaying or owing a large sum to the IRS for your taxes and would like to know if your payments are accurate? Do you want to make sure the financials for your business are correct? 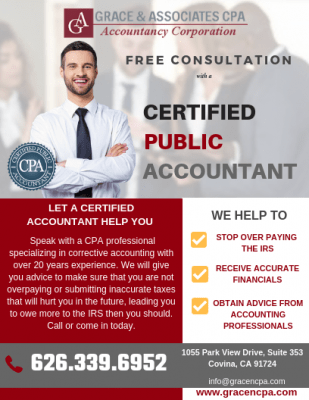 Speak with a CPA professional who specializes in corrective accounting with over 20 years experience. We will give you advice to make sure that you are not overpaying or submitting inaccurate taxes that can hurt you in the future, and lead you to owing more to the IRS then you should. Call or come in today.